The imposition of economic sanctions is curious. If sanctions have coercive power, powerful sanctions ought to deter rivals from pursuing objectionable policies. On the other hand, if sanctions will be ineffective in a particular case, would-be imposers ought to give up and not lose out on the gains of trade. Why, then, do we see sanctions at all? In a new working paper from Brad Smith and myself, we argue that asymmetric information about a leader’s consolidation of power plays a critical role in the coercive process. (Edit: I am happy to report that the paper has officially been accepted International Studies Quarterly!) Sanctions ostensibly turn a subset of the selectorate against the current regime. Whether that subset will be pivotal in sparking regime change is critical to determining the effectiveness of sanctions. Because local leaders know their own political predicaments better than foreign adversaries, would-be imposers sometimes have to guess whether sanctions will be worthwhile or not. Brad and I analyze such a predicament using a formal model. When the potential imposer is sufficiently certain that the target is robust to sanctions, it backs down so as to avoid the economic damage of ineffective sanctions. In contrast, if the imposer believes that the target is vulnerable, weaker opponents sometimes concede the policy issue and sometimes bluff strength. The imposer then sometimes calls potential bluffs (to stop the weaker types from cheating too much) and sometimes backs down (to avoid sanctions a tougher target). While the outcomes are vastly different, we find an important result regarding the imposer’s quality of information. As the imposer becomes sufficiently certain that its target is weak or strong, the probability of sanctions imposition goes to 0. This is either because the imposer backs down at the beginning (thinking it is facing a tougher type) or because the weaker types have less incentive to bluff toughness. In turn, sanctions are most likely when the imposer is less confident about his opponent’s consolidation of power. This yields a clear testable hypothesis: we should observe fewer sanctions as quality of information increases. Of course, information (i.e., quality of intelligence estimates) is very difficult to measure. Fortunately, recent works from Scott Wolford and Toby Rider indicate that leader tenure is a useful proxy. Leaders earlier in their careers represent greater unknowns. Over time, publicly observable actions and intelligence gathering improves intelligence estimates. Thus, we expect the likelihood of sanctions to be decreasing in the length of a target’s tenure. Sure enough, the data support this hypothesis. Moreover, tenure is substantively significant. 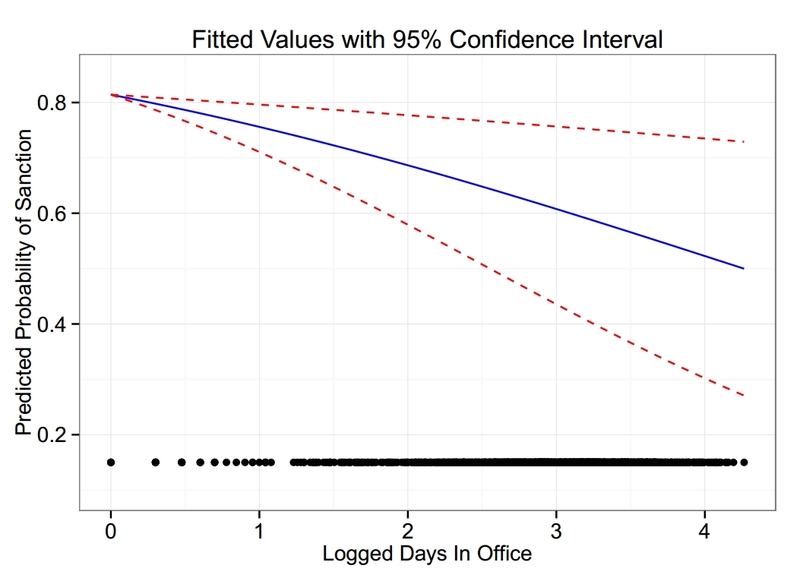 The plot below shows the predicted probability of sanctions given a crisis as a function of logged leader tenure, holding other observable factors at their medians. A crisis occurring four years into a leader’s term, for example, is 22% less likely to end in sanctions than if the crisis occurred at the beginning. Further, the effect is strongest for autocratic regimes. This fits with the theory. After all, compared to democracies, it is harder to tell who the winning coalition is in an autocracy. Increases in tenure thus generate more information about an autocrat’s vulnerability to sanctions, which in turn more precipitously drops the probability of sanction implementation. Beyond the theoretical and substantive results, we think a key takeaway is further confirmation of tenure as a proxy for uncertainty. We encourage other scholars to consider using it in empirical models where asymmetric information affects outcomes. Once again, here’s the paper. The abstract is below. When do states impose sanctions on their rivals? We develop a formal model of domestic power consolidation, threats, escalation, and imposition of sanctions. With complete information, the target regime’s consolidation of power determines the result—leaders with stable control can weather sanctions and thus deter their imposition, while vulnerable leaders concede the issue. However, when an imposer is uncertain of a foreign leader’s consolidation, vulnerable types have incentive to bluff strength. Foreign powers sometimes respond by imposing sanctions, even though the parties would have resolved the crisis earlier with complete information. We then hypothesize that opponents of newer leaders—particularly in autocracies—are more likely to suffer from this information problem. Employing the Threat and Imposition of Sanctions (TIES) dataset and carefully addressing selection problems common to the sanctions literature, we show that sanctioners are indeed more likely to follow through on threats against such leaders. This entry was posted in Political Science, Sanctions and tagged Political Science, sanctions. Bookmark the permalink.